Here are a few exceptional scenes in this movie. 1. The scene in which a foreigner peeps through door glass and just then constable throws a stone. Shocking scene with nice sound design. 2. The receptionist getting shot while she tries to save a kid in Taj Hotel. 3. Passengers hiding on the side of platforms. I don’t know if it is really happened. The way it is shown is first-of-its-kind. 4. The interrogation scene where Kasab tells him about glory of being a jihad. 5. The scene in which Nana Patekar makes Kasab realize about jihadi and glory. RGV has made this film with responsibility and this is the kind of subject he puts his heart and soul into while making. Ram Gopal Varma has been a great director since his first film Shiva. 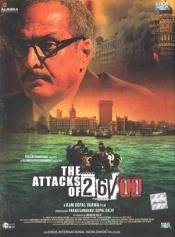 RGV has told the story 26/11 as a narration of the top cop played by Nana Patekar. The entire film focusses mainly on the journey of Kasab from the moment he entered into a hijacked boat till the moment he was hanged in Pune’s jail. Ram Gopal Varma has touched Leopold killings, CST killings, Cama Hospital killings, Taj hotel first killing episode (reception area) and killings that happen when Kasab is captured. Nariman House episode and things happened in Taj Hotel after Kasab is captured are not covered. Varma has retold the entire sequences of the events the way they happened. The detailing is exceptionally good. The devastating terrorist attacks on Mumbai on November 26th, 2008 will always remain as a scar in the history of India. One of the most extensively covered occurrence, the 26/11 attacks have had various representations in the past including a detailed documentary and a small time shoddy feature film on the same along with a televised series too. After all of that and five years from the time of the attacks comes Ram Gopal Varma's big scale cinematic depiction of the callous happening. Whether this turns out to be soul-stirring or not, let's find out. The story takes off with Joint Joint Commissioner of Police Rakesh Maria's (Nana Patekar) chronilogically narrating the occurrence of the ill fated day. Cut to the sea where a group of armed terrorist tries making its way to the shores of Mumbai. The make their way into the city through Colaba and within no time wreck havoc in the 12 most prominent spots in Mumbai. Although in RGV's interpretation, we only are witnessed to the brutality of the attacks on places like Cafe Leopold, CST station, Cama Hospital and Taj Mahal hotel. How the trained terrorist hold city hostage for 60 hours is what follows through the rest of the plot. Some of the sequences in the film stand out and leave a lump in your throat, for example, the ones where the general public comes to the aide of the victims of attacks outside Leopolds Cafe. Also the sequences of the attacks inside Taj Mahal Hotel. Even the police's inability to control such a grave and looming occurance is brilliantly depicted. Ram Gopal Varma's The Attacks of 26/11 doesn't do justice to the shocking brutality of the ill fated day but doesn't thorougly disappoint either. The film has its soul-stirring moments but they are very few.